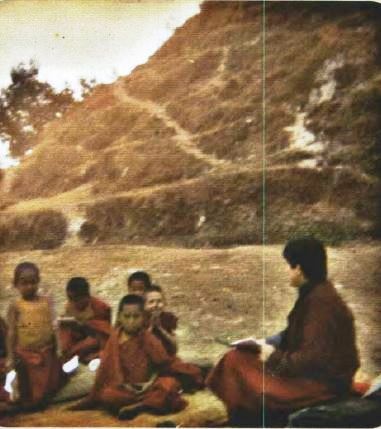 Susanna Parodi teaches the little monks English – and they try to teach her Tibetan. At the end of 1976 Lama Yeshe sent personally signed Christmas cards to hundreds of students around the world. The usual retreats were held after the Ninth November course and once again, Lama asked Andy Weber to teach thangka painting. Andy’s wife was pregnant at the time and he commuted between Kopan and his home in Boudha, outside central Kathmandu and just down the hill from the monastery. “One afternoon Lama called me to his room, gave me a cake and said, ‘Go and see your wife quickly!’ I raced down the hill and found she was in terrible pain. There was fear she would miscarry. A doctor was called and she calmed down, but how did Lama know? The attack happened just half an hour after I got to Kopan and she had immediately begun praying to Lama for help. Later, our son was born safely,” Andy told me. Lama Yeshe gave Andy his first commission, asking him to paint a very big Manjushri thangka for the new center in England.